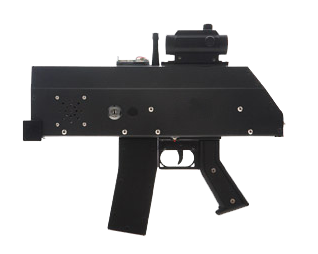 The submachine gun class is often the most popular class of laser tag weapon due to its lighter weight and rapid, controlled firing capability. They are compact and easy to use. In close quarters they can be deadly. However, in our outdoor maps, their effective range then comes into play, making them less effective than the rifle and LMG weapons class. Depending upon the weapon simulation they also function in fully automatic, burst fire, and semi-automatic modes. There are multiple choices of the submachine class simulation, but the replicas most often emulate their real life counterparts, shown here: the FN P90, MP5, and Uzi. The FN P90 is another of our personal favorites. This Belgian-made submachine gun is light weight, and has an unusual but very cool form factor. It has an extremely high rapid fire in full auto mode and a 50 capacity magazine. It is heavier than both the MP5 and Uzi replicas. Like all the submachine gun class weapons, it is extremely effective at close to medium range, but loses effectiveness on larger battlefields. 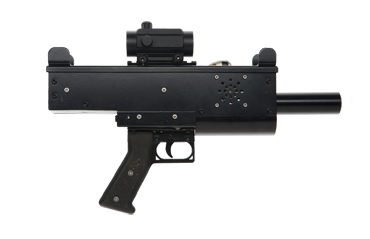 You can read more about the history of the FN P90 on Wikipedia. The MP5 replica is overall the most popular weapon on the battlefield. It is lightweight and easy to use, so it works for just about any age, skill, or fitness level. The MP5 has a high rate of fire, but not as high as the P90. It has a 30 capacity magazine and takes 4 seconds to reload. Like all submachine gun class weapons, it is extremely effective at close to medium range, but loses effectiveness on larger battlefields. You can read more about the history of the HK MP5 on Wikipedia. The Uzi replica most often simulates the Uzi or MP5 weapons. The Uzi has a 30 capacity magazine, and a very high rate of fire. Like the MP5 replica, it is lightweight and easy to use, so it is a great choice for just about any age, skill, or fitness level. 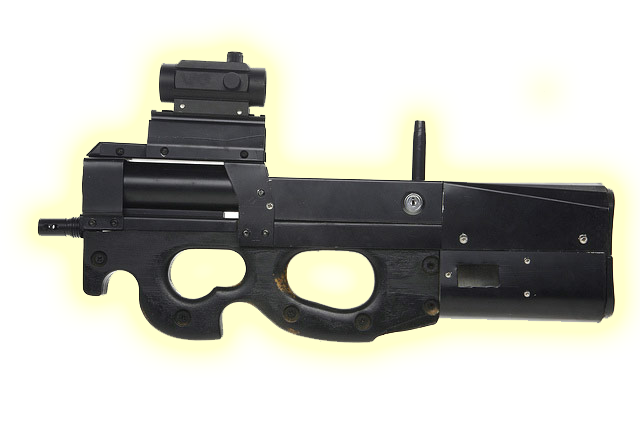 Like the other submachine guns it is highly effective at close to medium range, but loses effectiveness on larger battlefields. You can learn more about the history of the Uzi on Wikipedia. The rifle and LMG class weapons are the workhorses of the battlefield. Longer range and high rates of fire make them excellent choices for assault and defense. For the most realistic combat experience, these two classes of weapons are unmatched.